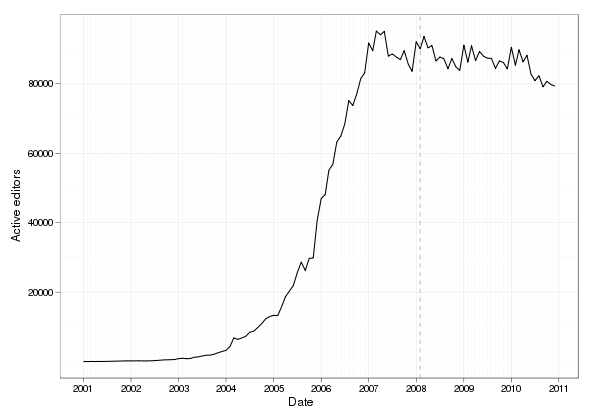 It’s been reported for some time now that the number of active editors on Wikipedia (usually defined as people who have edited at least 5 times in a given month) peaked in 2007 and has been mostly stable since then. A graph of the total number of active editors in every month since Wikipedia’s founding is shown below. The graph shows the aggregate numbers for all language Wikipedias. English Wikipedia is the largest component of this and is generally more variable. That said, very similar patterns exist for most larger languages. Felipe Ortega, who has provided many of these statistics, has warned against fatalist claims. Although there seems to be a decrease in the total number of active editors over the last two years, the situation seems to have somewhat stabilized in most languages. New editors in Wikipedia are replacing folks at almost the rate that they are leaving. It is also widely known that the number of readers of Wikipedia has been increasing during this period. According to the report cards released by the foundation using comScore data, the number of unique visitors to Wikipedia each month has increased by 61 million people in the last year — over 17%. This discrepancy between rising readership and stable or sinking editorship should raise major concern. After all, the Wikimedia Foundation’s mission is two part: (1) to empower and engage people around the world to collect and develop educational content and (2) to disseminate it effectively and globally. Although the Foundation report cards include measures of raw levels of editorship, a better metric of engagement and empowerment might be the proportion of readers who engage in editing. I could not find reliable data on the number of unique readers reached each month for more than a few months in the last year. What is available, however, is wonderful data on page views each month going back to 2008. Analysis of the data from available report cards show that, at least during the last year, there is a very stable ratio of 35 page views per unique visitor, as estimated by comScore. Using that measure, we can do a back of the envelope estimation on the proportion of users that are editors for the period where page view data is available, dating back from February 2008 ( marked with the grey dashed lined above). The graphs below show the very different results you get when you consider the change in the number of Wikipedia editors and the change in the editor-to-reader ratio. Once again, these data are combined data for all language Wikipedias although graphs look very similar for most larger languages. The results are striking. Although there has been a 12% decrease between February 2008 and December 2010 in the number of active editors, there is a 42% decrease in the proportion of readers who edit at least five times a month. We can see that fulfilling the first half of the Wikimedia mission remains a struggle. Although the graphs above do not say anything directly about the most active core contributors to Wikipedia, the fact that Wikipedia is being maintained by a tiny — and shrinking — proportion of its readership does mean that the idea behind Wikipedia is under threat. Although none are as big as Wikipedia, there are lots of good encyclopedias out there. The reason Wikipedia is different, interesting, and important is because — unlike all those others — Wikipedia is the encyclopedia that anyone can edit. Wikipedia is powerful because it allow its users to transcend their role as consumers of the information they use to understand the world. Wikipedia allows users to define the reference works that define their understanding of the their environment and each other. But 99.98% of the time, readers do not transcend that role. I think that’s a problem. Worse, that the number is growing. The Wikimedia Foundation recently ran a major successful effort to attract donations in its annual fundraiser. Jimmy Wales’ smiling mug is apparently enough in the way of motivation to get something like 1% of its readers to donate money to support the project. I think that’s very good news. If the Wikimedia community can entice even half of those people to contribute through an increased involvement in the projects themselves, they might do more than ensure Wikipedia’s continued growth. They would help take a step toward the empowerment and engagement of those users in sharing their own knowledge, and the continued fulfillment of a critically important mission. On the back of another envelope, it would be more revealing if we could set apart users from mobile devices, which I imagine might be growing fast, and from whom we wouldn’t expect edits at the moment (hoping usability folks can figure this out!). Apparently, current mobile page views correspond to ~4.6%. I couldn’t find numbers for unique mobile users. Also could not find stats for fraction of mobile page views in the past. In any case, it seems reasonable to suppose this number was significantly lower in 2008. Then, there is the fact that people will usually read much fewer pages on a mobile, and nowadays there’s also the (I’d say minor, for now) issue with tablets and some mobile browsers reporting themselves as non-mobile. So this hints that the actual number of unique visitors from mobile devices could have a large impact in the result you’ve sketched. Of course, I don’t expect this to explain away the extreme downfall, but it would be nice to clear one serious issue (mobile editing) from the many less clear issues we must strive to understand. You claim that “Wikipedia is the encyclopedia that anyone can edit”. Unfortunately this is wrong. If you add a new page it most likely is not relevant and is deleted very soon. Even if you edit a page, it is very easy to violate one of the thousands of Wikipedia laws and get your changes reverted. (For example a “List of …” article can only point to things that already have a page. Obvious, isn’t it?) Readers that edit pages soon learn that their changes are not welcome. This is more true for the German Wikipedia than the English Wikipedia. I have to agree that Wikipedia cannot really be edited by anyone. Wikipedia is experiencing something common in many academic and business situations, where a small cadre of tenured “experts/managers” defines the information’s appropriateness and accuracy. Wikipedia would be better off if it made deletion more a public activity as opposed to the moderated one. Say accurate/inaccurate/plain stupid voting on new posts. I’d also like to postulate on why the editor numbers are going down. Could it really be that much of the historical info has now been entered? Leaving fewer article opportunities to just the new data? Fewer opportunities = fewer editors. Is there data available that could test this theory? It would be useful to interview/survey average viewers about their experience of trying to make edits or add pages, to see why they do or don’t come back to edit more. Anecdotally, my experience, which I’ve seen echoed in blog posts around the web: I’ve made minor spelling/grammar corrections to dozens of articles. But each time I’ve tried to make a more substantive contribution it’s been removed. So I’m left feeling frustrated and dissatisfied with the experience, and feel no motivation to contribute more. To let my edits survive, it seems like I’d have to contribute a huge amount of effort to defend them against hostile competitors. How could the editing experience be changed such that quality is maintained, but potential contributors don’t feel that their efforts are unappreciated? 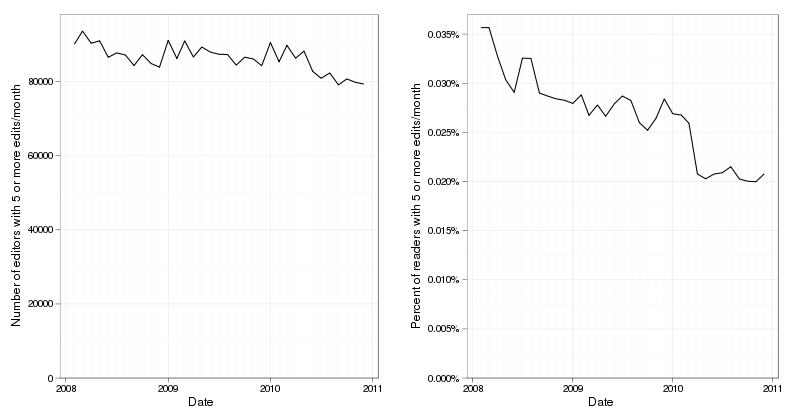 The stagnation in number of editors is quite easy to explain, and Wikipedia only has itself to blame. Wikipedia has a rather draconian anti-Proxy (including anti-Tor) policy that prevents casual reader-editors from participating. It’s no longer the online encyclopedia that “anyone can edit”. There are 3,500,000 English Wikipedia articles. It’s far more relevant to graph editors against edits that survive, and editors against new pages. Everything that fits the Wikipedia community’s somewhat arbitrary ideas of notability is in there. Not that much new notable stuff is happening in the real world, and it’s hard to fit novelty into existing pages, let alone improve them. I’ve yet to see one of the hundreds of Wiki whiners, who invariably show up complaining about how their precious edits didn’t survive, actually cite their revisions. Maybe you’re all not as competent and relevant and neutral as you think you are. Nearly everyone: I agree there are systematic barriers to contribution in Wikipedia. I hope that this analysis helps provide some incentive to identify those (in ways like Charlie has suggested) and to address them. The first step is to identify the causes driving this decline. I think that looking at the numbers we are all familiar with in the way I’m proposing makes the problem much more clear than it has been in previous analyses. Dave: I don’t believe that Wikipedia is finished. The decline in the proportion of editors who read is similar in many other languages (like German and French) which are much smaller than English. Certainly, a large proportion of things suitable for one Wikipedia would be suitable for another. If the pool of potential articles is similar in size between Wikipedia, it seems unlikely that the reason for the decline is that we’re just done. skier: Certainly not all new editors are socialized into Wikipedia’s process. The onus should fall on Wikipedians to help motivated users learn how to contribute. You don’t have to agree with Wikimedia’s first part of its mission to engage and empower users. Most wonderful academic reference works do not do this and still provide very useful resources to the world. It also seems quite likely that many Wikipedians don’t actually care about this part of the mission. But for those that do, and presumably the WMF does, declining levels of engagement in relative terms does represent a problem. Like most commenters here, I have to agree that Wikipedia is not as newbie-friendly as it once was. I contributed several articles 5 years ago, but I’ve mostly stopped contributing (except for grammar fixes) because of the strict rules (one could even say censorship in some situations) of editing Wikipedia. Instead, I’ve gotten more involved in OpenStreetMap, which (for now at least) is more like Wikipedia was 5 years ago as far as welcoming important contributions. Granted, maintaining such a huge database as Wikipedia is a fine work, and requires to ensure that the many contributions accumulated in these 10 years are not wasted, but maybe Wikipedia has really become too strict a community to welcome newcomers. On the same subject, this is also something that has kept me from contributing more to Ubuntu in the last few years: it was easy and very welcome 5 years ago, but the amount of rules and processes have increased too much to let occasional contributors get involved without having to become “experts”. Maybe this is the fate of huge community projects (Jono, a theme for you?) to struggle to find a good balance between rules/processes and welcoming new contributors. I have the same experience as many – I have made contributions only to have them removed and deleted. Sometimes I edited an existing and useful article only to see it deleted days later as ‘not notable’. Notability nazic are in full force. So are people deleting all references to blogs and all ‘original research’ as in information that has not been explicitly published in some non-blog online source. IMHO if there is a wish to increase participation, then Wikipedia needs to expand scope – reduce notability, original research criteria and remove the ban for blogs as references. To me, the biggest practical issue stems from how a small cabal of people can nominate and delete an article as “non-notable” with as few as one vote. These people generally don’t seem to know the domain of the article nearly well enough to be making these decisions, and the whole work suffers from it. But the attitude that creates this in the first place is worse: That there’s even a concept known as “Deletionism” is incredibly dangerous to information as a whole. It is now 2011; there is no excuse for deleting or losing information. There is only incompetence or malice. Wikipedia is the “encyclopedia that everyone can edit” but that doesn’t mean it is the encyclopedia that everyone should edit. It probably has got harder to start editing as standards have raised & patrolling more efficient, and sometimes heavy-handed. Personally I worry more about the absolute declines in editing, especially among the 250+ pcm group who are actually the backbone of WP. Contrary to what some some (above & elsewhere) WP is very far from having all the articles it could. Most people begin by trying to edit very heavily-trafficed articles, which is a mistake. There are thousands of less prominent & pretty crap articles where reasonable edits will not be reverted. but is this the same as saying “99.98% of the time, readers do not transcend that role” as the 80K figure is active contributors…? Would it be better to use all unique visitors against all contributors (whether active this month or not)? Joseph: Thanks for bringing this up. SJ and I talked about this while I was writing this. I think we’ll both agree that there’s no clear quantitative metric that captures transcending one’s role as a consumer. I’m not any more convinced that having made a single edit ever is a better metric for “transcending that role” than having made 5 edits in a given month. For that matter, I’m sure my own read-to-edit ratio is near 100:1; have I really transcended that role? I figured that the definition of active editor that WMF uses in own internal report cards was the most rhetorically valid metric for the argument I wanted to make to the audience I wanted to make it to. The current editor trend survey uses lots of metrics (including the one you measure) to measure editorship and I think that’s a much more defensible position. So I think you’re right. But I’m still willing to stand behind my choice of language. Pingback: Edit-Wars in der Wikipedia: Flüchten oder Standhalten?